We published an essay on the importance of religion recently. But our readers mus know the importance of atheism too. 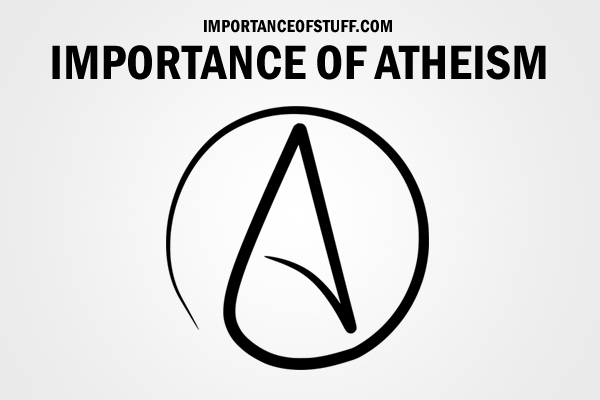 So, this article tells you why atheism is important for our society. Atheist is a person who doesn’t believe in God and adopts the approach of rational thinking to explain the natural phenomenon on the planet. The concept of Atheism persisted since ancient times and has been at the forefront of different inventions that changed the path of human civilization. In modern world when scientific advancements are proceeding at a rapid pace, the importance of Atheism will only increase. Let’s analyze how it is playing a dominant role in the lives of people. The advances made by ancient astronomical science were not possible if the society was deeply religious. Some individuals used scientific reasons in major discoveries and inventions. Only atheism encourages people to ask questions in order to attain knowledge. For ages, people believed that the earth was the center of universe until proved wrong by Galileo and Copernicus. Discoveries such as human genome mapping and other inventions are the pinnacle of rationalities. For centuries, it is drilled down in our psyche that god is watching and will judge people by actions. In recent times with the advent of social media, religious sermons are being disseminated far and wide to every nook and corner of the globe. We are taught that God would punish us if we are not compassionate however atheism believes that people should treat others with respect as they are fellow humans. The golden principle of life states that people who love other will get love in return. Scientific reasoning plays a very important role in protecting the people from fraudsters trying to sell their products and services in the market. For instance, slimming pills that claim to reduce the weight of the individuals have to provide exact mechanism to the relevant authorities. If they are not successful, the product is banned from the market. Similarly governments that do not mix religion with politics tend to rule people using rational and scientific values. Countries with religious motives tend to deny the rights of the people and also subsidize the endeavors of the religious organization. Religious superstitions are implemented with iron hand and voice of dissents muzzled into submission. Atheism is essential to enforce the equality of all citizens and protect the minority from oppression. Religious beliefs should be personal and strictly followed within the four walls of the room. An atheist society is known for expressing the thoughts freely. Therefore, people can differ as far as the opinions are concerned. It promotes democratic values that make the society vibrant and democratic. Overtly religious communities stifle opposition and prepare the ground for armed revolts. How many times we have seen wars fought in the name of superstitious beliefs that existed for centuries? Renaissance in Europe was not possible without the introduction of atheism. Political forces using religion as a tool can break the unity and harmony of the society. Atheism is a counter force that uses light of knowledge to break the religious and social taboos existing in the society. In a society, where a child is involved in religious ceremonies from the birth, atheism is really improtant. Like any other thing, religion must be criticized, there are a lot of bad things that happen in every religion. Many times, these religious people make sure that no one raises a voice against these wrong deeds in the name of religion. That’s why atheists are important for any society. These are the people who think rationally and can show you the other side of the coin. They are not the ones who believe on anything without knowing the whole truth.